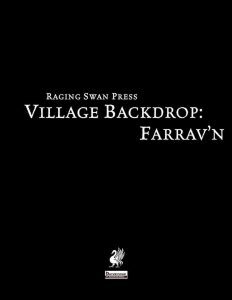 This installment of Raging Swan Press‘ Village Backdrop-series clocks in at 13 pages, 1 page front cover, 1 page editorial, 2 pages of advertisement, 1 page SRD, 1 page back cover, leaving us with 7 pages of content, so let’s take a look! Okay, first things first: Farrav’n is situated within a stretch of desert called the luminous desert, a region, which is lavishly-mapped in a gorgeous, isometric map. This section also defines the surrounding environment, which is somewhat crucial to understand the nature of this settlement, for Farrav’n is indeed a holy site and a place of solace for the weary traveler through the deserts: Devoted to the mostly forgotten nature goddess Rrav, the settlement is a unique sight: It is basically situated in a crater dug out of the desert sands, ringed by a circle of staves that hold sand and storms at bay with purple, divine light…for it is here that the prophetess Jenndra was led to dig and find a new home. It should btw. be noted that the luminous desert actually is a mechanically-relevant hazard of sorts, impeding water-creation mechanics. The section also provides guidance to predict imminent worm attacks and the like. NICE! The oasis thus generated by divine providence has since then become a fierce competition for the less savory Shadescar Oasis, erstwhile home of the children of Rrav, where cutthroat gnolls still follow a rather ruthless creed. Farrav’n, in contrast, may be overseen predominantly by gnolls, but they are gnolls that have renounced their evil ways, making the settlement a natural fit for e.g. the Southlands of Kobold Press’ Midgard setting, but that as an aside. Now, as always, we do get notes on local color and dressing habits, nomenclature and local lore, as well as a table of 6 whispers and rumors for PCs to unearth. No less than 5 different sample NPCs are provided in the classic, fluff-only write-up Raging Swan Press tends to employ: I.e., we get a brief line on suggested power-level/classes, but otherwise focus on personality, mannerisms, etc. Instead of a unified table of events, this pdf benefits from the extended content made possible by Raging Swan Press’ patreon – i.e., we get one event table of 6 events for sand’s edge, the magical border of the village, and one 6 entry-event-list for the oasis public access. Now, beyond these, we also receive a massive table of 20 sample events of local color to be used throughout the village, including being potentially run over by frolicking gnoll children (with CMB-values noted), tasty smell of meats, etc. – all in all, this is a surprisingly NICE place, one defined in both laws and cultural traditions, by the worship of Rrav that freed the gnolls from the cycle of violence. If that alone does not suffice for you, you should be aware that the village does sport some really amazing points of interest: Yes, there would be the visitor’s tent, the public resting place of sorts…but what if you don’t like tents? The Tan Worm, that’s what! Basically, the oasis contains a massive, taxidermized/alchemically-treated variant purple worm that acts as a home to many of the locals! Come on, that is amazing! Now, it should be noted that the pdf follows Raging Swan Press’ evolved formula for Village Backdrops: That means that, beyond the general marketplace section, each of the points of interest lists the respective services you can procure and the items available in its own entry. We also get read-aloud text for the individual points of interest and for the aforementioned sample NPCs. Oh, and before you ask, yes, the PFRPG-version does get its proper settlement statblock. Have I mentioned the scorpion circus? Or the fact that relevant mini-quest suggestions are provided throughout the pdf? Editing and formatting are top-notch, I noticed no glitches. Layout adheres to Raging Swan Press’ two-column b/w-standard and the pdf comes with not one, but two fantastic maps by Tommi Salama. (You can get these in a key-less high-res version, at least to my knowledge, by joining the patreon, just fyi.) The pdf comes fully bookmarked for your convenience and is included in two versions: One optimized for the printer, and one optimized for screen-use. Mike Welham has a serious gift as far as I’m concerned. The basic premise of Farrav’n is honestly not one that had me particularly excited. Good gnolls playing against the trope? Okay, seen that before. Where Farrav’n won me over is the details: We get mechanical tidbits here and there; we have these exceedingly cool locations/points of interest. We have slight touches that make the surrounding desert special. Purple worm house. Scorpion circus. Purple-glow-ringed crater in the sand. Just picturing Farrav’n is an inspiring exercise, as the settlement comes to life. The surprising innocence and joy that is mirrored in the little pieces of local dressing and color make sure that this is a place the PCs will not only relish finding, they will want to defend this atypical slice of kindness and shelter in a thoroughly hostile desert. As an aside, I can see this work, with serial numbers filed off, in a scifi-context with minimum hassle. Did I hear Dune somewhere? Anyways, Farrav’n is an intriguing village that greatly benefits from the evolved and expanded formula of the series, one that shows that artistry in the details and little flourishes can elevate something familiar to something thoroughly unique. I adore this place. 5 stars + seal of approval. You can get this cool, magical oasis here on OBS!